File integrity monitoring helps you verify that files and folders with sensitive data have not been changed. Organizations can help maintain file integrity by auditing their file storages regularly. File integrity monitoring software can determine whether anyone made any content changes across your file servers. By adopting a good file integrity monitoring tool, IT teams can stay up to date about unauthorized modifications and thereby minimize security and business risks. File integrity monitoring is critical for both security and compliance. Any organization that deals with highly sensitive data, such as cardholder information or medical records, is responsible for the security of the file servers where this data resides. In fact, this is one of the top requirements of most common regulations, including PCI DSS 11.5, HIPAA and FISMA. Netwrix Auditor for Windows File Servers helps organizations enable file integrity monitoring on their Windows-based file storages. The application facilitates file integrity by auditing changes to files and folders across file servers, including their creation, modification and deletion, and provides answers to questions such as who changed what, and when and where each change occurred. As a result, organizations can ensure ongoing file integrity checking. In this age of cyber-threats, the risk to sensitive data is greater than ever before. 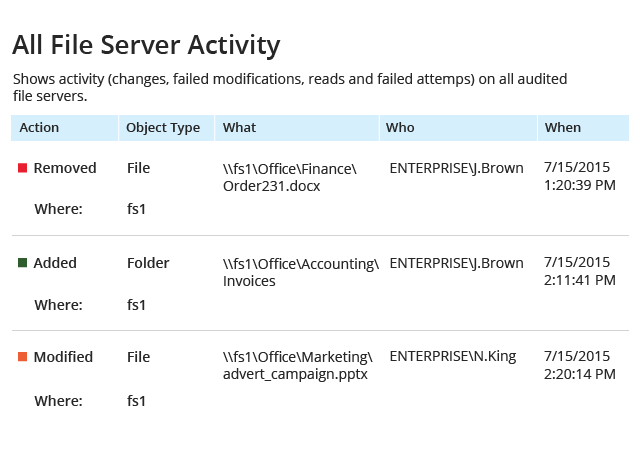 With file integrity checking tools that deliver deep visibility into what’s going on across file servers, IT teams can quickly spot and thwart suspicious activity that could otherwise lead to a security breach or business disruption. In addition to helping your organization better protect sensitive data, Netwrix Auditor also enables you to pass audit checks with less effort by providing out-of-the-box compliance reports that proper file integrity monitoring controls are in place.